Yesterday was my first foray into the world of gluten free baking. My husband decided about a month ago that he would like to try a gluten free diet -we've managed to have a lot of good meals but have just avoided anything that required bread (though we did have some pretty good "panini" on waffles!). We now have an exchange student living with us for a month and last night was our first sit down dinner at home since she's been here. I was confident in serving gluten free pasta but wanted to have some kind of bread to go with our dinner. Even though I didn't have all the right flours I tried out this recipe from Book of Yum. I didn't have brown rice flour so used white rice flour - I also didn't have teff so wasn't able to try her modifications. I shaped them more like a hamburger bun (because I bought some Sunshine burgers to try out) but they didn't last long enough to try it with a burger. They were quite good! I split them in half and brushed them with melted garlic butter, sprinkled with parmesan and bit of salt and broiled them for garlic bread. Tonight I took one of the rolls and sliced it thin, rubbed it with a garlic clove, brushed with oliv e oil and baked in a 450 degree oven until toasted and made crostini with olive tapenade and feta cheese. 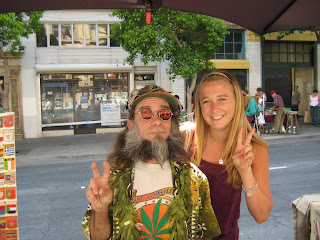 Again, we were both quite happy with the results. I went to Whole Foods and bought more flour so I'm looking forward to trying it with the modifications given by Sea. 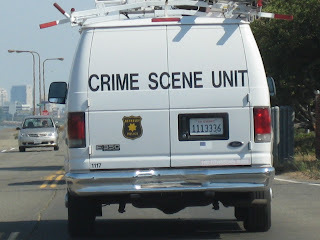 And we were very curious as we drove behind this van out of the Berkeley Marina - CSI Berkeley!